The Beatles' eighth UK album caused a seismic shift in popular music. Recorded in over 400 hours during a 129-day period, Sgt Pepper's Lonely Hearts Club Band helped define the 1967 Summer of Love, and was instantly recognised as a major leap forward for modern music. The mood of the album was in the spirit of the age, because we ourselves were fitting into the mood of the time. The idea wasn't to do anything to cater for that mood – we happened to be in that mood anyway. And it wasn't just the general mood of the time that influenced us; I was searching for references that were more on the fringe of things. The actual mood of the time was more likely to be The Move, or Status Quo or whatever – whereas outside all of that there was this avant-garde mode, which I think was coming into Pepper. There was definitely a movement of people. All I am saying is: we weren't really trying to cater for that movement – we were just being part of it, as we always had been. I maintain The Beatles weren't the leaders of the generation, but the spokesmen. We were only doing what the kids in the art schools were all doing. It was a wild time, and it feels to me like a time warp – there we were in a magical wizard-land with velvet patchwork clothes and burning joss sticks, and here we are now soberly dressed. Even more so than its predecessor, Revolver, Sgt Pepper saw The Beatles pushing boundaries within the studio, creating sounds which had never before been heard. They made extensive use of orchestras and other hired musicians, and combined a variety of musical styles including rock, music hall, psychedelia, traditional Indian and Western classical. From the fairground swirls of Being For The Benefit Of Mr Kite! to the animal stampede that closes Good Morning Good Morning, Sgt Pepper's Lonely Hearts Club Band signalled to the world that The Beatles were no longer the loveable moptops of old, unwilling to sing simple love songs and perform for crowds who were more interested in screaming than listening. 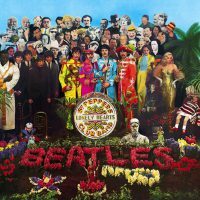 The album was always going to have Sgt Pepper at the beginning; and if you listen to the first two tracks, you can hear it was going to be a show album. It was Sgt Pepper and his Lonely Hearts Club Band with all these other acts, and it was going to run like a rock opera. It had started out with a feeling that it was going to be something totally different, but we only got as far as Sgt Pepper and Billy Shears (singing With A Little Help From My Friends), and then we thought: 'Sod it! it's just two tracks.' It still kept the title and the feel that it's all connected, although in the end we didn't actually connect all the songs up. At the core of Sgt Pepper is the sound of The Beatles' English background, with tales of runaway girls, circus attractions, Isle of Wight cottages, domestic violence, home improvements, Daily Mail news stories, memories of school days and favourite childhood literature – far from the riches they enjoyed as the most famous foursome on the planet, but remembering times past and wondering what the future would hold. Prior to the release of Sgt Pepper, however, many commentators believed The Beatles to be over as a group. They had ceased touring and largely retreated from public view, and Penny Lane/Strawberry Fields Forever had failed to top the UK singles chart after its February 1967 release. I read a quote from George once where he stated for him making Sgt Peppers was not a pleasant experience. It was Paul’s baby and he only allowed the others to contribute as he saw fit. Personally I prefer the White Album and Revolver and Abbey Road being my fav Beatles album. I’m sure you have Martin on camera or tape saying this correct? All I’ve ever seen Sir George speak about was how he took two “incomplete” songs given to him from Paul and John where he worked out the basic arrangement which eventually became Day In The Life. Beatles Bible states that “Sgt. Pepper” was issued (in the UK) on 1st June 1967. I am certain it was issued on 26th May 1967. The Beatle Monthly magazine issued on 1st June 1967 indicates that the release had already happened and the album entered the UK album chart at No. 1 on a chart published 1st June 1967, both signifying that the release must be before 1st June. Interestingly, the 2017 50th anniversary remix/reissue was released on 26th May 2017, which ties in exactly with what I think/remember as being the original release date in 1967. Game changer. I think John outshone Paul on this one. The most creative song (in my opinion) was George’s song, though. That song changed me. I would like to know if you intend to take into account the information that appears in the 50th anniversary deluxe edition of “Sgt Pepper”. There are lots of new and interesting things. For example, John’s bass in “Fixing a Hole,” George’s mellotron on “Strawberry …” or Paul and Ringo drumming on “Good Morning …”, which explains that full sound. However, there are also contradictions or omissions. For example, in “Strawberry …” they do not say who plays the piano or percussion. In “A Day in the Life” it says that John plays piano, but it does not specify if it only refers to the final chord, because in the line-up it does not specify who they played in that chord. In “Being the benefit …” they omit John’s piano and Lowery, but they talk about a Martin mellotron. What do you think? A number of sources (Wikipedia being one, so tread lightly) say that the album was going to be called Dr. Pepper’s LHCB, but wasn’t because of the soda in the US. If true, that puts Macca’s name origin story in a different light. On Sgt Pepper, (on the CD) shouldn’t the “hidden track” be somehow hidden instead of tagged on the end of A Day In The Life? Like with a signal that the CD is over and just ends, unless you hit the skip button to go to the final track before it stops (if you want to hear it). I mean it would be a little more “in the day” that way. Beatles fandom myth begins…”Sgt. Peppers is the first concept album”. Myth dispelled by actual Beatle John, who says, ” besides the opening song leading into the next song, you could take any song off this album and put it onto any of our albums”. Of course, as we all know, a concept album is when all songs were written with a predetermined theme each relating to another. When I’m 64 was written by Paul when he was 16. Benefit for Mr.Kite was written by John by essentially rewriting what he had read off an antique poster.